A couple of weeks ago I shared with you a few things about my current capsule wardrobe process that don’t work so well for me along with my main wardrobe goal for 2015. So far I have successfully created + executed + enjoyed three seasonal capsule wardrobes. My summer, fall and winter capsules all went over virtually without a hitch — modifying things a few times here and there to truly make the idea work for me. It wasn’t until I began looking forward to creating my fourth (and final, for lack of a better term) Spring capsule that I really began to reflect on whether or not this process, as I’d laid it out thus far, was working. After considering some of the aspects that didn’t totally jive with me I began to desire a year round wardrobe that incorporated many of the parameters originally adapted from the Unfancy idea of a capsule wardrobe, but that also allowed me to continue doing things that I was good at before the thought of a capsule wardrobe ever permeated my brain: like my ability to thrift good quality clothes from Goodwill + Ebay — year round. But enough with all the deep thought right? On to sharing and answering the question: what the heck does an “all seasons capsule wardrobe” look like? 1. Design what your ideal 75 piece wardrobe looks like, aka the “master list”. Haha. Yeeeeaaahh. Totally on that one Laura… that’s not intimidating at all. I don’t know that I ever filled one out in it’s entirety, but the free wardrobe planner via Unfancy is a great tool to help you begin to get your style simply out of your head and down on paper — making it a more tangible thing to work with. Also, because I’m an extremely visual person, Pinterest has been a great tool to help me a long my way. I use my style/capsule wardrobe Pinterest board to bookmark + see all at once wardrobes that embody, completely or in part, my style. I use my style/ fall + winter and style/ spring + summer not only for outfit inspiration for my current wardrobe, but also as ideas for key missing pieces in the year round wardrobe I now long to create. Speaking of numbers, 75 is a totally arbitrary number that I have come up with that I simply think works for me. I may find that I will drastically reduce this number or need to increase it as my life situations change + evolve. Currently I operate in 4 different realms: office, farm, social + mom. I like to see as much overlap as possible, but you could argue that I’ve chosen 25 items per realm. Of course 75 is just a number — one I find extremely generous but minimal in the sense there is max. Choose a number that works for you! And finally. 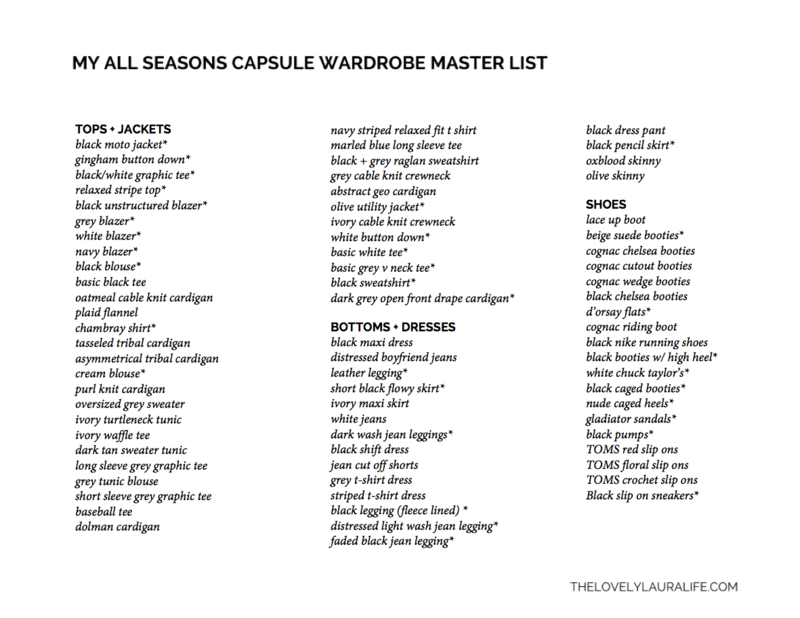 Below you will find my current all seasons capsule wardrobe master list. [If you click on it will open the full res PDF version]. I’m sure this list itself will change + evolve over the course of the year in some minor, an maybe even major, ways — but right now, it feels really good to have my big picture. Like, really good. Note* I have identified items to be replaced or to get with an asterisk. All other items have been a part of my past seasonal capsules. 2. Set a budget for the year. Mine is $520 [I explain why below]. One of the reasons I adopted a seasonal capsule wardrobe in the first place was the desire to get a hold of my spending. I did not like the fact that I knew I was spending too much on clothes, but not able to actually put a number to it. Only buying clothes 4 times a year forces you to create and stick to a budget for sure — but for me it was still too easy to justify a budget for the particular season that sounded reasonable, but when viewed alongside the big picture — didn’t add up the way I wanted. Apparently I’m a big fan of the ‘big picture’ these days, because I had an exact number in my head for my yearly clothes budget that I knew would not only make me feel good, but do an accurate job of aligning my financial resources with my priorities. For me, that number is $520. Ten dollars a week or forty bucks a month for me to spend on clothes [something I consider a creative outlet] sounds: minimal for sure + challenging + in line with where I want percentages of my money to go. Of course your budget is exactly that, yours. Figure out what aligns with your priorities. 3. “Edit” your wardrobe throughout the year. This is where I lay down a few ‘rules’ or ‘parameters’ if you will to give this process the structure and simplicity that I think anyone who uses this kind of wardrobe model desires. #1 Nothing goes into your closet without first making it on the master list. This means: 1.) that you make sure you stay within your max item limit. Want to add something totally new? Something else has go to go… And 2.) that there has also been a significant amount of thought that has occurred. My master list ‘confirmation’ time period is, again, one week. If the item hasn’t been on there a week, it means I need to wait a little longer. #2 Buy things when they are on the low. As in on sale, out of season, etc. #3 As much as possible, buy second hand items. 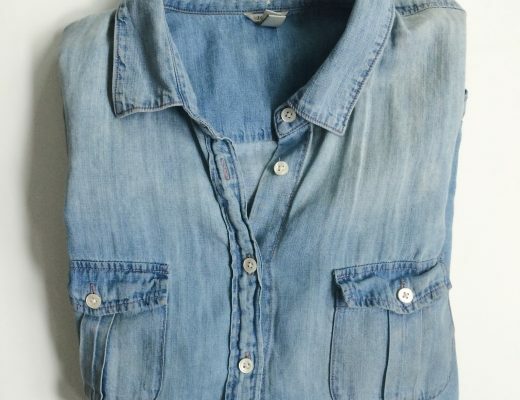 Hand me downs, Goodwill, Ebay, other second hand clothing stores — these are your friends. Of course this not to say that I won’t be buying new items, but I know from past purchases that I can often get higher quality/higher end pieces that are gently or hardly used at all into my closet simply by thrifting them. Otherwise they might not make it in there in the first place. 4. And finally, at the end of the year take a step back and do a little happy dance because you + your wardrobe rock. This one is just for fun, but of course you know I will totally do it. Whew. You guys. That was a lot. But that’s it! That’s the plan! My hope is that it still provides the structure I need to pursue a more minimalist approach to style but the flexibility to purchase thrifted + new items year round. What are your thoughts on an all seasons capsule wardrobe? Great ideas! I started following you because you are my favorite of all the bloggers that were chosen on Unfancy and your recipes are right up my alley, but mainly because you are pregnant! So I am desperate to know how you have so much clarity regarding your a year-round capsule wardrobe during pregnancy! I am 12 weeks along with my fourth child, and I JUST completed my first trimester capsule wardrobe and am super nervous about my second semester capsule wardrobe. I should know how big I’ll be and how I grow throughout pregnancy by now, but I got rid of all my pregnancy clothing, and the whole process of trying to fit a growing body is a bit daunting. What is your best maternity advice to lock down your capsule wardrobe? Thanks! Thank you, thank you so much! You probably have no idea how much it means to me to hear that! Okay. So I’ve thought for a bit about your question and I’m not sure if you’re going to like my answer, lol. I think the reason I’m able to have so much clarity regarding my year round capsule — while pregnant — is because I’ve been experimenting with it for the past 9 months. So, in essence, time. I’ve invested a lot of time in the whole process. Or patience, if you want to look at that way. For me, the clothing items I desire and ones that clearly express my style, haven’t changed throughout my pregnancy. I’ve just been forced to find maternity versions or learn how to wear non-maternity pieces around a bump. I think that covers that…? And as far as continuing this process while trying to fit a growing body? I couldn’t agree more. Totally daunting. But I really didn’t like the idea of “winging it” the way I did with my first pregnancy either. I’m not sure if I have one best piece of advice as far as locking down a maternity capsule wardrobe, but I did write a blog post a little while back with 5 tips that I think made me successful in doing so, if you haven’t already checked it out. I also think my fall capsule, which was to accommodate a much smaller bump, gave me practice for nailing my winter (and current) capsule. 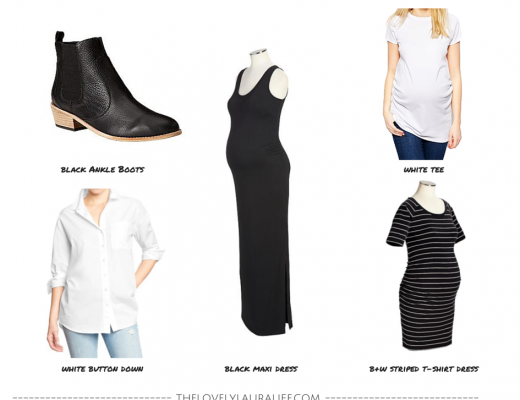 I like the proportions of maternity + non-maternity items much better in my winter capsule. I really hope that wasn’t a horrible answer — let me know if you’re still left with questions! You have to have a much better grasp of your personal style and clothing needs to pull off a master capsule. Maybe since you are now on your 4th capsule you have that sense. I find the limits of shopping only 4 times a year to be self-limiting and de-stressing. The idea that I put away clothes intentionally and limit the amount of choices available at a particular time also is appealing to me. Then again I live in Alaska, which has vastly different summer/winter clothing needs. I may eventually follow Caroline’s transition to 2 capsules, but a master capsule is beyond my reach for awhile. Congrats on figuring out your style! I still wonder sometimes if a two seasons capsule might be where I ultimately end up — but right now I really do feel confident in this approach and that it fits my lifestyle and certain things I want to accomplish. I too liked the limiting nature of only buying 4 times a year — because it removes the possibility from the equation completely, however I’m a thrifter at heart and it almost completely eliminated that joy of mine unless it just happened to time out. This is also the other way that I have found to drastically reduce the amount of actual money I spend on clothes. I may still find myself concentrating my spending only four times a year so as to waste less time thinking, planning, buying, etc. but I like the idea of having the flexibility of a yearly budget and being able to seize the moment when certain items on my master list crossed my path! I guess we’ll see how it all works out in the end ;) Thanks for all your kind words, I hope to hear from you again! Oh and good luck with your capsule wardrobes! I recently discovered your blog via Unfancy, and I love your style, advice, and honesty. I would like to eventually get to a place where I know that everything in my closet year-round is timeless and useful, so I am SO excited to see how this works out for you. Thanks so much! And yes! Timeless and useful is the goal!! I want to spend more time and energy on the people and more important things in my life — without sacrificing my sense of style. A tall order, but totally worth aspiring for. I am excited to share my experiences so It makes me pumped to hear your excited too. Thanks again, hope to see you around! This article is exactly what has been going through my head as of late. I am just beginning my third capsule and have been feeling this need of more simplicity. I don’t like how much time I am spending planning each capsule (though then I don’t spend time on what to wear for 3 months!) and I feel that planning out four capsules per year gives me an excuse to spend more money than I ultimately want to as well as own more clothes altogether than I want to. I have been working on a master list recently. I think I may implement it after I complete a full year of capsules the Unfancy way. Glad someone else gets me! And I totally agree that starting the capsule off in the seasonal way really helps you understand your personal style (and beat bad shopping habits!) Can’t wait to see more posts on thai subject from you! I love the way you do a capsule wardrobe! I’ve been combining Caroline and Anushka’s (into-mind.com) tips to make my capsule wardrobe, but I love the idea of a master list. So, I just stumbled across your blog and I’m actually doing something very similar. Have been reading up on capsule wardrobes for awhile, but found that living in New England, I need more of my wardrobe available throughout the year to be comfortable. I actually just created a master list with 82 items (also including shoes), and also plan to try to thrift items as much as possible to complete my wardrobe. So far, so good, but I have 6 items I need and about another 15 I want to replace before I’m satisfied. I’m so excited to hear about how yours turns out! So awesome! I also have some pieces that I hope to “upgrade” in the next year or so! Alas, the budget. Haha! Haha Kristin, I understand completely! I live in Nova Scotia, so I have a similar climate – never know if I’ll be needed a sweater or shorts. This past year I’ve never had anything stored away, because the temperature range is so wide in variance that you never know what you’ll need! Awesome idea Laura! I’ve just started building a season capsule, but I find I wear all types of clothing throughout the season (Ie, I’m the kind of person that will wear sweaters in the summer and short sleeves in the winter). This makes it difficult to try to get your wardrobe down to only 33 items – especially once you through in your work’s dress code. I’m currently reading everything I can about capsule wardrobes and was glad to see a different opinion from someone who has experienced it :) however…I was wondering if you would share where you got your booties that are pictured from? with the buckles. I’m on the hunt for a pair :) thanks! I found them at Kohl’s actually, one or two seasons ago (still love them!) But I have seen these and these that are both similar in look — one a bigger investment than the other. :) Hope that helps! Less IS More. | Buoy. 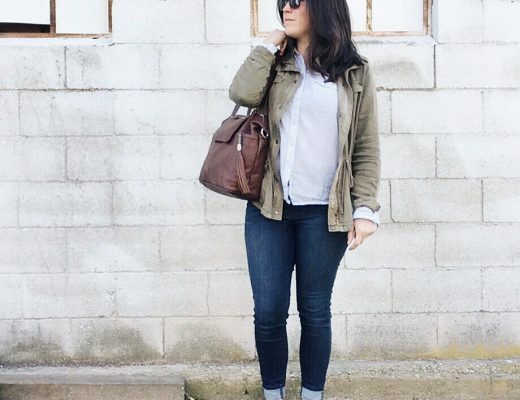 I love the idea of a year round master capsule wardrobe! I’m new to the capsule wardrobe game and I’m finding my first try – a Fall/Winter wardrobe – extremely difficult because I leave somewhere you get about two weeks of fall and one month of winter. I’ve got a beautifully curated Fall wardrobe and it’s too damn hot to wear it! Buying a wardrobe for just one season doesn’t work where I live, so I love the idea of just having a master wardrobe that works for all seasons, and maybe adding a piece here or there based on when I need it. Seems simple, but I would have never thought of it! Fantastic post! 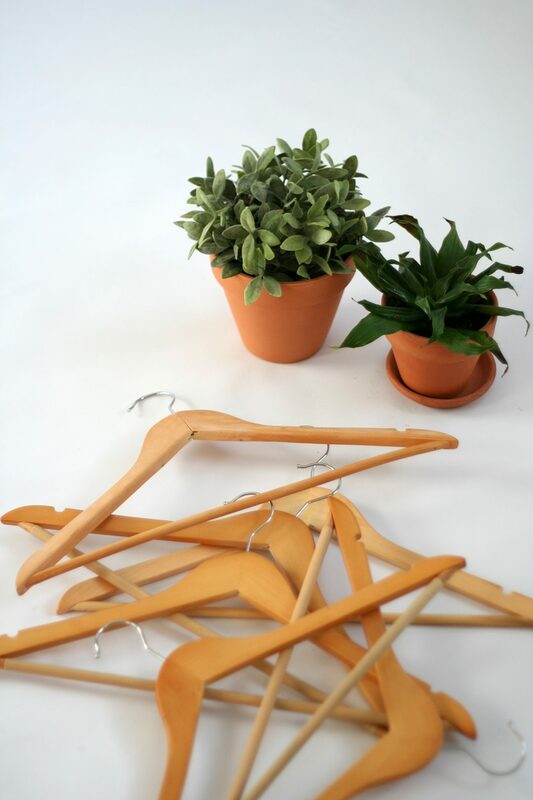 I am doing this myself, and have a little way to go to clear all the clutter – but nothing new is going into my wardrobe unless something else can go out. So it’s a start. I have a few less skirts and no dresses, but plan to add these in during the coming year. It really does make sense to have an all seasons basic wardrobe. Have 2 skirts or trousers in base colours. Navy or brown for colder months and grey or denim for summer. Use dark and light tops to mix and match with scarves as accessories. Keep one lighter jacket and one wool mix coat. Stick to navy footwear – this looks good all year round. As well as the necessary underwear keep a shrug or cardigan and one sweater. This is probably too minimal for some of you but would be a start allowing for some leeway especially if you like clothes shopping. I buy most of mine second hand as it works out much cheaper and am supporting charity in the process. My wardrobe gets a spring clean twice a year with the stuff donated back to charity. 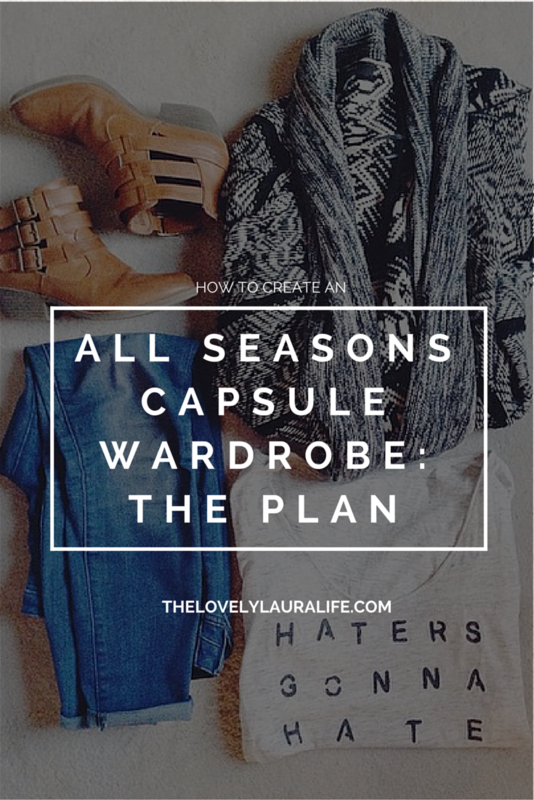 I love the idea of an all seasons capsule wardrobe. Thanks for sharing your tips! I love this! I’ll definitely use this guide as I curate my own ideal minimalist wardrobe!